This month we have a new case study for our readers. Many people want to know what Nancy’s house looks likes. Well, here it is. 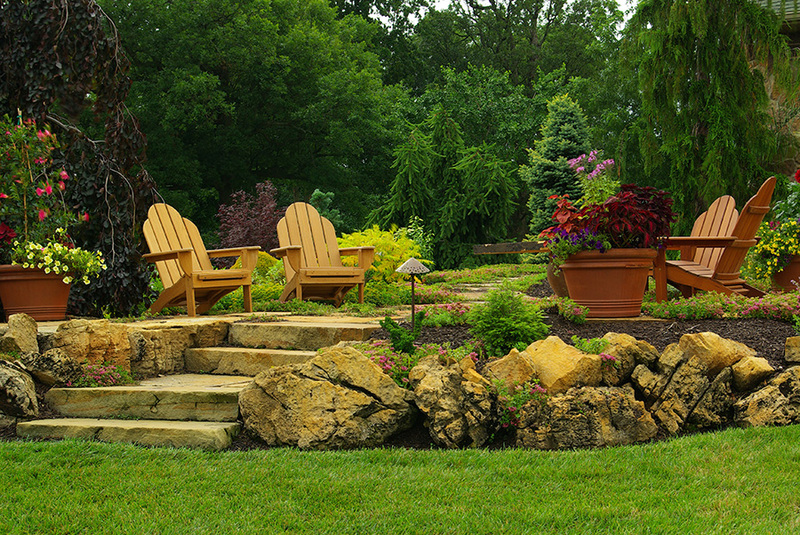 This property won the 2012 Indiana Nursery and Landscape Association’s Award of Excellence in Residential Landscape Design/Build category. Where do we begin with this one? From the day ground was broken for the house over Twelve years ago this property was designed to be a landscaping marvel. The house is situated among hundred year old oak trees. During construction Nancy & Roger were adamant about large equipment encroaching upon the roots of the trees. The construction site was cordoned off to within 15′ of the house. This insured that there would be no construction equipment/traffic over the roots of the existing old growing trees. All but one survives to this day. In the shade of the large old growth trees live dozens of Hosta varieties. There are multiple flagstone paths leading from garden to garden as well as strips of green grass that form their own pathways around the acres of gardens. Nancy & Roger are both very passionate about plants and either one of them could discuss for hours the various intricacies from species to species and subspecies to subspecies. When it comes to hardscaping and stone work there are many steps that go into a successful design and installation. This is a step by step look at an award winning project in Chesterton, IN. This project won the Indiana Nursery & Landscape Association (INLA) 2012 Award of Excellence, Hardscape Installation category. Wow Small’s Landscaping. How did you do that?